A few days ago, I ventured the opinion that foreign affairs don’t win General Elections. I was premature. There is one foreign issue that could decide the election. Greece. If Greece leaves the Eurozone or defaults, the Conservatives will gain. On Friday, Jeroen Dijsselbloem, the chairman of Eurozone meetings of finance ministers, expressed his frustration at the attitude of the Greek government. They had allegedly not talked any proposals towards meeting the conditions required to receive another £7.2bn of loans. Without these loans the Greek Government is expected to go bankrupt next month. They are tied to a series of reforms the government would have to implement, including cutting pensions, reforming labour markets, privatising state companies and increasing VAT. It is worth bearing in mind at this point the words of a highly experienced senior diplomat I was speaking to recently. 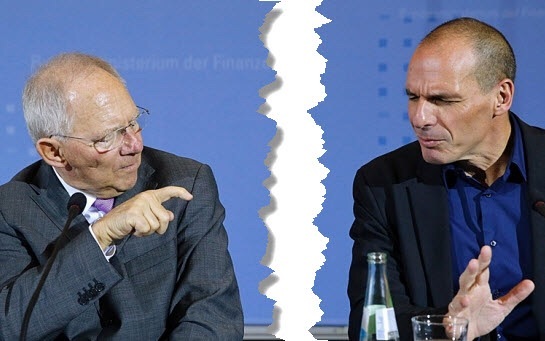 Speaking in a personal capacity, the diplomat pointed out that “the problem is that Syriza was elected on a lie. They told the Greek people they could extract Greece from the mess it is in with no pain, and the Greeks voted for that.” This means that Syriza don’t actually possess a mandate to give in to the EU. The EU finance ministers are wary in particular of moral hazard, in which they give Greece what they want in return for no reforms, meaning that the Syriza-led government may realise that if they continue to take talks to the edge like this they will continue to be granted concessions. So, in practice, we are real yo reaching a point where something has to give. If what has to give is Greece’s membership of the Eurozone, our General election here will take on a different tone. Greece leaving the Euro, despite its small size, will mean that debts will be unpaid, capital flight will destabilize the Eurozone, and the instability will spread like wildfire across the continent. At times like that, the electorate may want to “cling to mother” as the terrible phrase goes. “Mother”, in the case of the UK, is the Conservative Party. “Mother” is sticking to what we have now and not taking any risks. The idea propagated by Labour and the more left wing of the nationalist parties that austerity can just be abandoned with no consequences will be seen as far more risky. In that case, foreign affairs most certainly will affect how people vote on May 7th. « “Labour’s rent controls” are nothing of the sort. Just redressing imbalances in the provision of a basic need.